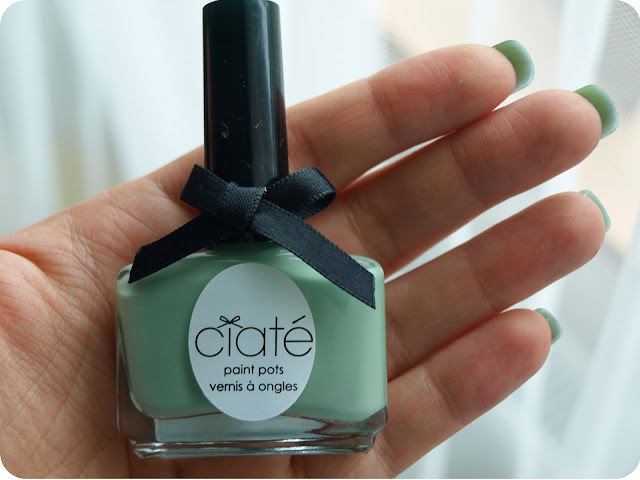 Apples & Custard must be my favourite Ciate nail polish. 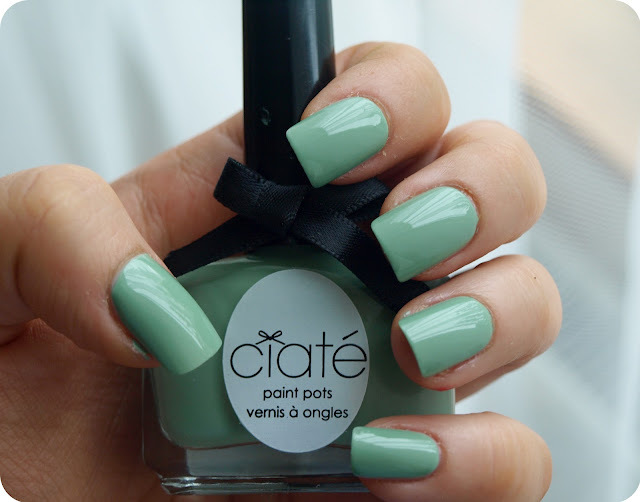 It is similar to Barry M Mint Green , but it is much darker and more green. It is a beautiful shade and only needs 1 generous or 2 thin coats to provide a perfect, opaque and glossy finish. It is streak free and dries quite fast. I am very impressed with it! If you are looking for a perfect Mint Green that doesn't look blue, you won't be disappointed with this one! I noticed that in dark light it looks much darker, but in daylight it is definitely a mint green colour. I mentioned how much I love the bottle design in my previous reviews, but I just can't stop admiring the cute bow and the shape- gorgeous! EDIT: On the picture above I used fake nails that were white and I think it affected the colour and with one coat the green looked much lighter than on my natural nails. I am adding pictures of the nail polish on white paper so you can see how it looks like, also a close up of the polish on my natural nail. As you can see it depends on the light. The day I painted my nails with Apples and Custard for the first time it was very bright and the colour looked much lighter to me.